For all the youngsters out there, Kate Jackson is successful actress who is best known for her role as Sabrina Duncan in the hugely popular 1970s television show entitled, Charlie's Angels. 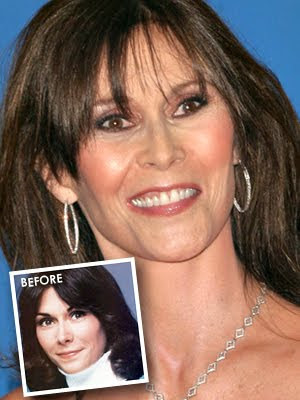 Kate Jackson was an absolute doll in the 70's, however the present day Ms. Jackson is looking awfully different and mighty surprised, which is most likely attributed to plastic surgery. The actress appears to have an untouched nose and her cheekbones were always very prominent, but its her eyes that have taken a different form, which could be the result of brow lift or even heavy botox on the forehead and surrounding areas. I think she looks dazzling. I am a rinder-fug nose-ogg. Can it be undone.? Natural is better!